The following publication has been contributed by Democratic Dialogue. The views expressed in this report do not necessarily reflect the views of the members of the CAIN Project. The CAIN Project would welcome other material which meets our guidelines for contributions. This publication is copyright Democratic Dialogue 1998 and is included on this site by permission of the publisher. You may not edit, adapt, or redistribute changed versions of this for other than your personal use without the express written permission of the publisher, Democratic Dialogue. Redistribution for commercial purposes is not permitted. Design: James Keenan Design Printed by: Graham &Heslip Ltd. The research for this report was funded by the Central Community Relations Unit and by the Community Relations Council under the European Union Peace and Reconciliation Programme. We would particularly like to thank Denis McCoy at CCRU and Mark Adair and Stella McDermott at CRC for their continuing help and support. Part of this work was undertaken as part of a larger ongoing research project, funded by CCRU, into parades in Northern Ireland run by the Centre for the Study of Conflict at the University of Ulster at Coleraine. We would like to acknowledge the ongoing support and assistance of Seamus Dunn, Tom Fraser and Pat Shortt at the Centre. The Centre has published two reports on the subject of parades and the third is forthcoming. The research for this report involved travel to each of the nine countries that we discuss below. In each of those countries we received assistance from many people in a range of official, voluntary and political bodies. We do not intend to list all the people who we have interviewed and spoken to but we would give our sincere thanks to all of them and hope that we have represented their views and experiences fairly. It is a similar situation in Northern Ireland, where innumerable people have contributed in one form or another to our understanding this subject. However special mention must be made to Janet Quilley, Alan Quilley and Robin Wilson with whom we have had many fruitful discussions on this subject over the past two years. We would also like to thank Colin Harper for his help and comments and James Keenan for the design and for turning the product round on an extremely tight schedule. It goes without saying that the interpretations of the material are those of the authors and responsibility for any errors remains the authors alone. Dominic Bryan is continuing to work on the research project into issues relating to parades with the Centre for the Study of Conflict, UUC. His PhD research into the Orange Order will be published in the near future. Nathalie Caleyron is completing a PhD from the Université de Saint Denis, Paris 8 on the influence of human rights issues on the Northern Ireland peace process. Ciro de Rosa has a research fellowship with the Instituto Universitario Orientale in Naples. His PhD research, completed in 1997, was on the importance of symbolic practices at parades in Northern Ireland. Neil Jarman is running a research project into political violence, community policing and public order with the Community Development Centre, North Belfast. His book Material Conflicts: Parades and Visual Displays in Northern Ireland was published by Berg in May 1997. Cover: Gay Rights activists protesting at their exclusion from the St Patrick's Day parade in New York, March 1997. 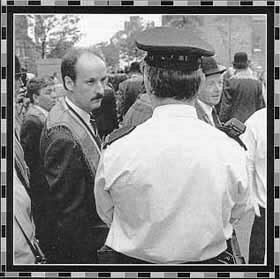 Introduction: Orangemen and RUC, Belfast June 1995. The Right to Demonstrate: Internment Rally Belfast City Hall August 1993. England: Masquerade Performer, Notting Hill Carnival, August 1997. Scotland: Orange Order banner at the Belfast Twelfth, July 1993. Ireland: Dublin Fire Brigades Trade Union Pipe Band, May Day Parade, Belfast 1995. France: Demonstrators at the International Aids Day march, Paris, December 1997. Italy: Memorial to eight people killed by a bomb at a trade union rally in Brescia in March 1974. USA: Uncle Sam on Parade, Boston, St Patrick's Day 1997. Canada: Canadian Women's Orange Lodge banner. Israel: Flags near Temple Mount, Independence Day celebrations, Jerusalem, May 1997. South Africa: Mural depicting the march to a democratic South Africa, Cape Town, September 1997. General Principles: Police on the Garvaghy Road, July 1997. Appendices: Apprentice Boy, Derry Day 1992. Parade and Protest, published in June 1996, examined parades and demonstrations in Northern Ireland and considered possible ways of resolving or reducing disputes that had occurred Over this issue. Since that time the number of disputes has risen, more areas have become involved and, after Drumcree in 1996, attitudes have become more entrenched. On the other hand, some of the changes that the report discussed have been introduced. After Drumcree 1996 the Government announced the setting up of a review into disputes over parades and marches under Sir Peter North. The Independent Review of Parades and Marches published its report in January 1997 (North Report). Its main recommendation was the setting up of a Parades Commission to facilitate mediation and to make determinations if mediation does not bring about a resolution. The Parades Commission has been in operation under the chairmanship of Alistair Graham since March 1997 but its effectiveness has been limited by the lack of statutory power. The summer of 1997 proved to be equally difficult with the dispute over the Drumcree church parade again worsening community relations. In the autumn of 1997 the Government introduced the Public Processions etc. Bill (later amended to the Public Processions Bill) which will give the Parades Commission many of the powers suggested by North. In this report we want to further examine the way public political expression is facilitated. In particular we will compare the legislation dealing with, and the practice of managing parades and protests in Northern Ireland with that of other jurisdictions. In the first part of this report we will assess some of the changes that have taken place in Northern Ireland and examine two case studies. In the second part we will examine the legal and practical facilitation and policing of parades, demonstrations and protests in England and Wales, Scotland, the Republic of Ireland, France, Italy, the USA, Canada, Israel and South Africa. During the course of the research for this report we have visited all these countries, spoke to lawyers, police officers, civil rights & political activists and academics and visited major events such as Sr. Patrick's Day parades in New York and Boston and the Notting Hill Carnival in London. Quite clearly no single place is exactly comparable with Northern Ireland and it would be foolish to believe that because something works in one jurisdiction then it would work in another. Nevertheless, we believe that there are lessons in all these places that might prove instructive in developing the conditions in the north for politicians, the police and communities to start to overcome the difficulties encountered in recent years. Consequently the third part of this report brings together the variety of approaches to public political expression for comparison. The nature of legal guarantees of the right to public political expression. The legal frameworks used to define and regulate the right to demonstrate and protest. The judgement of toleration and provocation in public political expression. The judgement of rights based upon tradition and custom. 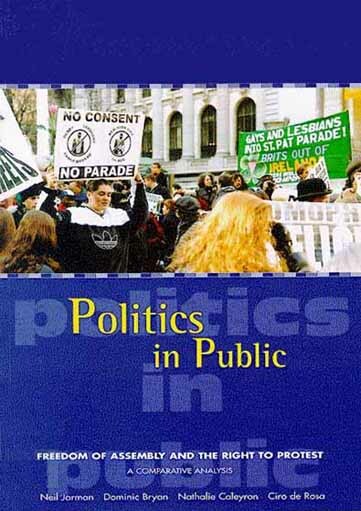 The role of the police as managers of public political expression and public order generally. The role of the community as managers of public political expression and public order generally.